In order for this testimony to be seen in its proper context, some background is necessary. Relentless kinetic and nonkinetic operations in Anbar by U.S. forces has accomplished two things throughout late 2006 and 2007. First, al Qaeda has taken a heavy toll among its numbers. The recent capture of an al Qaeda Emir’s diary catalogs the decline in fighers in one area of operation from slightly less than a Battalion to less than two squads. Prime Minister Maliki recently announced that al Qaeda had been routed from Baghdad due to the security plan the U.S. launched a year ago. The second affect of intensive U.S. operations is the co-opting of erstwhile indigenous insurgents into the concerned local citizens program. There are still ongoing operations in Mosul, but the al Qaeda campaign in Iraq is an abysmal failure. There has also been an increased difficulty in deploying to the Iraq theater. According to General David Petraeus, the influx of foreign fighters into Iraq is down, but not just due to any actions by Syria. “Much of the fall in numbers was due to countries barring young men from flying to the Syrian cities of Damascus and Aleppo on one-way tickets.” Conversely, Admiral J. Michael McConnel recently testified before Congress that “we have seen an influx of new Western recruits into the tribal areas [in Pakistan] since mid-2006.” But Western recruits are not the only ones who have traveled to the tribal regions of Pakistan and Afghanistan to join with Taliban and al Qaeda fighters (the so-called Federally Administered Tribal Areas). The Combating Terrorism Center at West Point has recently released Issue 3 of the CTC Sentinel, which includes an important article by Brian Glyn Williams entitled “Return of the Arabs: Al-Qa’ida’s Current Military Role in the Afghan Insurgency.” Within the context of the Iraq campaign, Williams sets up the coming Taliban / al Qaeda operations in Afghanistan as beginning in Iraq. By 2007, jihadist websites from Chechnya to Turkey to the Arab world began to feature recruitment ads calling on the “Lions of Islam” to come fight in Afghanistan. It appears that many heeded the call. This was especially true after the Anbar Awakening of anti-al-Qa`ida tribal leaders and General David Petraeus’ “surge strategy” made Iraq less hospitable for foreign volunteers. Since 2002, one of al-Qa`ida’s main roles has been diverting wealth from the Arab Gulf States to funding the struggling Taliban. One recently killed Saudi shaykh named Asadullah, for example, was described as “the moneybags in the entire tribal belt.” Men like Asadullah have paid bounties for Taliban attacks on coalition troops, provided money to Taliban commanders such as Baitullah Mehsud to encourage them to attack Pakistani troops and launch a suicide bombing campaign in that country, and used their funds to re-arm the Taliban. Local Pashtuns in Waziristan and in Afghanistan’s Kunar Province have claimed that the Arab fighters pay well for lodging and food and provide money for the families of those who are “martyred” in suicide operations. According to online videos and local reports, al-Qa`ida is also running as many as 29 training camps in the region, albeit less elaborate than those found in Afghanistan in the 1990s. The Arabs have also played a key role in “al-Qa`idifying” the Taliban insurgency and importing the horror tactics of the Iraqi conflict to Afghanistan. Key Taliban leaders, such as the recently slain Mullah Dadullah, have claimed that they learned suicide bombing techniques from their Arab “brothers.” Al-Qa`ida has also distributed tutorial jihadist videos throughout the Pashtun regions that give instructions on how to build car bombs, IEDs and inspirational “snuff film” images of U.S. troops being killed in Iraq. The first wave of suicide bombings in Afghanistan seems to have been carried out by Arabs, and it appears clear that it was al-Qa`ida—which has long had an emphasis on istishhad (martyrdom) operations—that taught the local Taliban this alien tactic. Arabs such as Abu Yahya al-Libi have also been influential in encouraging the technophobic Taliban fundamentalists to create “Islamic Emirate of Afghanistan” online videos of Zarqawi style beheadings, IED attacks and suicide bombings. Furthermore, it appears that Arab fighters have actively partaken in insurgent activities within Afghanistan itself in increasing numbers. Insurgents in the Kunar Valley in Nuristan, for example, have chosen Abu Ikhlas al-Masri, an Egyptian who speaks Pashtu and is married to a local woman, to lead a group of as many as 170 fighters. Arab operations in this area are facilitated by its cross-border proximity to Bajaur Agency and support from a local Taliban leader named Ahmad Shah and insurgent leader Gulbuddin Hekmatyar, the latter of which has a long history of working with Arabs. Arabs have also filmed themselves attacking coalition targets in Nangarhar, Paktia, Paktika, Khost, Uruzgan, Logar and Zabul provinces. Such actions hardly endeared the locals to the Taliban, and there are bound to be future tensions between the Arabs and the Taliban that echo those that often caused “red on red” conflict between Afghan mujahidin and Arab Wahhabis in the 1980s. The distrust between the Arabs—who come to the “backward” lands of Afghanistan from the comparatively developed Gulf States—are said to stem from the Arab puritans’ disdain for local Afghan Sufi “superstitions,” their most un-Afghan desire to achieve “martyrdom” and their wish to lead their own fighting units. A local Taliban commander captured the ambiguous nature of the Taliban-al-Qa`ida alliance when he claimed of the Arabs: “They come for the sacred purpose of jihad. They fight according to Shari`a law.” He then, however, added an important caveat: “No foreign fighter can serve as a Taliban commander.” Even key al-Qa`ida field commanders, such as the recently slain Libyan leader Abu Laith al-Libi (the commander who led al-Qa`ida’s retreat from Afghanistan in 2001), operated under the command of Mullah Omar. Despite the potential for tensions, al-Qa`ida’s head of operations in Afghanistan, an Egyptian named Mustafa Abu’l-Yazid, who is said to have good relations with the Taliban, has proclaimed that al-Qa`ida in Afghanistan recognizes the authority of Mullah Omar. For its part, the Taliban has charged one Mehmood Haq Yar, a Taliban commander who has allegedly been to Iraq to learn the Iraqi insurgents’ tactics, with making sure Arabs play a role in the Afghan jihad. It appears that both sides are united in their desire to topple the Hamid Karzai government and carve out an Islamic state in the tribal areas of Pakistan. While it is difficult to estimate the number of Arab fighters in the region, it seems obvious that al-Qa`ida central is determined to play a key role as a fundraiser, recruiter and direct contributor to the military efforts in both Afghanistan and Pakistan. Moreover, unlike the earlier generation of “gucci jihadists” who made little if any real contribution to the jihad against the Soviets, the current generation seems determined to remind the West that the “Lions of Islam” have not forgotten the “Forgotten War” in Afghanistan. The Afghanis are learning (ideologically) from the foreigners coming in to help the campaign, and also (tactically) from the Iraq campaign. In Afghanistan, the Taleban now claim to have influence across most of the country and have extended their area of control from their traditional heartland in the south. They are able to operate freely even in Wardak Province, neighbouring the capital Kabul, as a BBC camera crew who filmed them recently found. One of their commanders in Wardak, Mullah Hakmatullah, said they do not control the roads nor the towns, but they hold the countryside and have increasing support because of the corruption of the administration. “The administration do not solve people’s problems. People who go there with problems have to give a lot of money in bribes and then they get stuck there,” Mullah Hakmatullah said. Support from villagers is essential to their ability to continue operations through the winter months. The overall military commander of the Taleban in Wardak, Mullah Rashid Akhond, claimed to have 2,000 active fighters. The fighters say locals support their brand of justice. He said that he was operating an administrative system with orders coming from Kandahar in the south, just like during the days of the Taleban government that fell in 2001. Many of the suicide bombers who go to Kabul come from this area, just an hour’s drive away. Mullah Akhond justified them, saying that most of the attacks are now carried out by Afghans themselves, not foreign fighters. Afghanistan and Pakistan face the next generation Taliban, who unlike their predecessors, are more savvy concerning technology, but just as radical in ideology and without the baggage of the theological reluctance of suicide (or martyrdom) missions. Most recently, a suicide bomb was used to conduct offensive operations against Taliban enemies in Afghanistan, killing at least 80 men and boys. A suicide bomber blew himself up at a tribal festival near the southern city of Kandahar yesterday, killing at least 80 men and boys and wounding about 90 more in the bloodiest bombing in Afghanistan since 2001. Officials said the target was a key anti-Taleban commander who played a vital role in keeping the guerrillas out of a district they have been fighting to take over for more than two years. Abdul Hakim, who died in the attack, was a staunchly independent commander with the Alokozai tribe whose private army of 500 men had fought the Taleban and sometimes clashed with Afghan security forces as well. Mr Hakim, a former guerrilla in his late forties who had fought the Russians before serving for a while as the police chief of Kandahar, was one of the Taleban’s oldest and toughest foes in the Arghandab district west of the city. He first fought Mullah Omar, the Taleban leader, in 1994. Although too independent to be a formal ally of the Kabul Government, he had been credited with helping to hold back Taleban fighters in one of the most strategically important regions of southern Afghanistan. The Taleban have pledged to conquer Kandahar, their old capital, and have fought bloody battles with Canadian and Afghan forces in the Arghandab, an area of orchards and farms which is one of the main approach routes to the city. Mr Hakim’s death could be a heavy blow to attempts to hold them back. Dozens of his Alokozai tribesmen were also killed when the suicide bomber blew himself up at the tribal festival about 15 minutes’ drive from the city. The same tactics are in use in Pakistan, and Taliban operations in Pakistan and Afghanistan should be seen as fronts in the same war. The campaign in Afghanistan is utterly dependent upon supply routes through Pakistan. This video below shows the torturous mountain passes through which some supplies must travel and the enemy operations against these supply lines. More recently, Baitullah Mehsud’s forces have begun effectively to target main arteries through Pakistan to interdict these same supplies. Danger is on the rise in both Pakistan and Afghanistan, and yet the Afghan government is stolid and obstinate in its denial of the need for more forces, while this same government’s corruption is hindering counterinsurgency efforts. The campaign in Afghanistan drew down from conventional operations too soon, and yet this mistake is being repeated by drawing down from kinetic operations against the Taliban and al Qaeda in favor of military transition teams and road construction. The forces to effect both are apparently not in place, and there is an ever shrinking window of opportunity to win the campaign in the region, while also acknowledging the difficulty of drawing down in Iraq. In a winter that is worse than any in recent memory in Afghanistan, Taliban operations have been kept to a minimum. We should expect to see a resurgence in operations commensurate with the number of forces and motivation of the enemy. Last year the Taliban were supposed to have a fearsome spring offensive. They suffered a lot of casualties for not a lot of practical gains. Why are they going to do any better this time? There’s danger but I don’t think it’s coming from a spring offensive in Afghanistan. It’s more likely to come from the Taliban peeling of the NWFP from Pakistan and petitioning for admission to Afghanistan. Karzai could not turn that down as it’s been a long-term Afghan goal of all parties for over a century. All of a sudden the Taliban come in as provincial rulers, democrats, and genuine nation-wide popularity and get themselves voted in to power. That’s the real nightmare scenario. Your position is similar to the Army command talking points. It is dissimilar from Admiral Mullens’ position, who holds that there is a “growing insurgency.” Gates tows the line somewhere in between. I’m closer to Mullens. I happen to disagree that there were no tactical successes by the Taliban in 2007. The very fact that they control the countryside is statement enough. 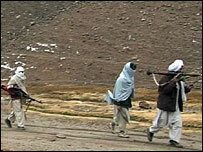 You are currently reading "Resurgence of Taliban and al Qaeda", entry #942 on The Captain's Journal. This article is filed under the category(s) Afghanistan,al Qaeda,Featured,Jihadists,Pakistan,Religion and Insurgency,Taliban and was published February 18th, 2008 by Herschel Smith.